I finished a Paris Loop. 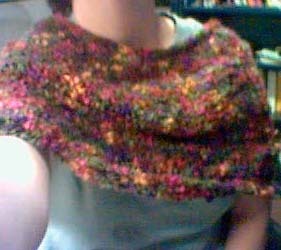 I like the pattern a lot, but should've used a different colorway and/or a single color yarn. Oh well, an excuse to go yarn shopping for new yarn! I'll see if one of my sisters or nieces would like this one as a gift. Or perhaps you? Leave me a note and let me know. Ever try to take a photo of yourself with a camera phone? The big white blob is my arm holding the phone under the cheerless fluorescent lighting. Paris Loop from Magknits.com; Yarn: Lion Boucle "Tutti Frutti", 4 balls. Needles: Denise 15, 11, 8.